A 32-year-old lady underwent a hysteroscopic myomectomy, elsewhere, for a suspected fibroid. Paraffin blocks of the excised tumor were submitted to us for review. Hematoxylin and eosin-stained sections showed a tumor composed of polygonal-shaped cells, arranged in cords and in small clusters containing moderate amount of eosinophilic-to-vacuolated cytoplasm and round nuclei. Interspersed were areas of hyalinization. 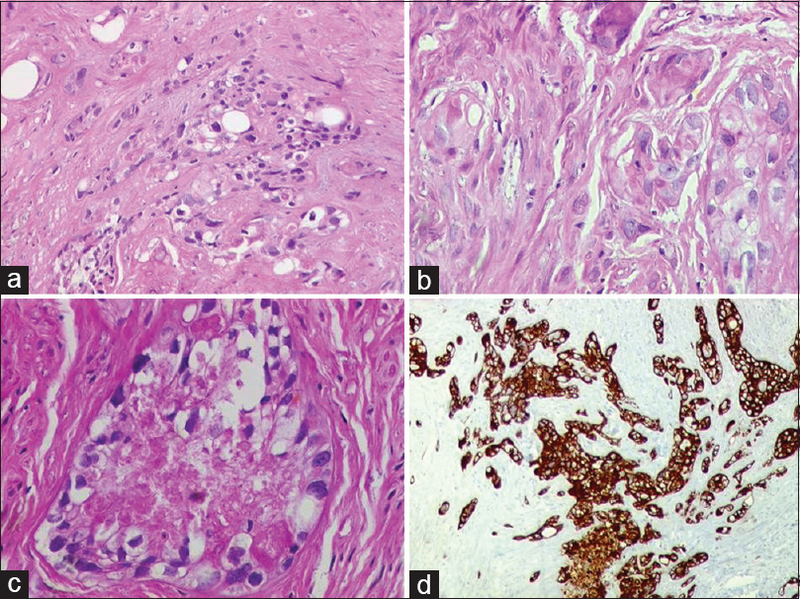 Individual tumor cells displayed moderate degree of nuclear atypia [Figure 1]a,[Figure 1]b,[Figure 1]c. On immunohistochemistry, tumor cells were diffusely positive for pan cytokeratin (AE1/AE3) [Figure 1]d.
What is the diagnosis or closest differential diagnosis? What additional ancillary test(s) would be useful in this case? Biopsy showed a lesion composed of proliferating fibroblasts, randomly oriented and in short intersecting fascicles within a focally myxoid stroma. Towards the peripheral side of the lesion, as well as focally within the stroma, there were fragments of woven bone, lined by active osteoblasts and few multinucleate osteoclasts, imperceptibly lending with the fibroblasts [Figure 1]c and [Figure 1]d.
What is the diagnosis? Answer: Myositis ossificans. According to the World Health Organization (WHO) classification of tumors of soft tissue and bone, myositis ossificans and fibro-osseous pseudotumor of digits (FP) and are self-limiting, localized lesions, essentially comprising two components, namely cellular fibrous tissue and reactive bone. Invariably, these lesions are associated with a history of injury, which could not be procured in the present case. However, in view of involvement of the phalanx, which constitutes as one of the frequent location of this lesion; radiologic findings, combined with histopathologic features, diagnosis of MO was offered. Various extraskeletal osseous lesions include myositis ossificans, fibro-osseous pseudotumor, fibrodysplasia ossificans progressiva, soft-tissue osteoma, and extraskeletal osteosarcoma. Although myositis ossificans (MO) and FP are analogous lesions; it has been reported that unlike MO, FPs lack well-defined zoning pattern. On radiologic imaging, while MO invariably appears as a well-defined, lytic lesion with a lucent centre and peripheral calcification, FP is characterized by an ill-defined soft tissue mass with focal calcification. The present case, on radiologic imaging, was consistent with MO, while on microscopic examination had overlapping features between MO and FP. The other lesion in this spectrum is florid reactive periostitis, which additionally comprises chondroid elements. Lack of significant nuclear pleomorphism in the spindle cells and characteristic radiologic features, made diagnosis of an extraskeletal osteosarcoma, less likely. There have been earlier reports on FP and MO, involving the digits., Recently, USP6 rearrangement has been identified, as underlying genetic event, driving most MOs. Furthermore, this provides compelling evidence of a relationship of MO with nodular fasciitis and aneurysmal bone cyst. The presented case emphasizes upon combination of radiologic and histopathologic features, in formulating diagnosis of musculoskeletal tumors, especially the fibro osseous lesions. Rosenberg AE, Oliveira AM. Myositis ossificans and fibro-osseous pseudotumor of digits. In Fletcher CD, Bridge JA, Hogendoorn PC, Mertens F eds. World Health Organization Classification of Tumours of Soft Tissue and Bone. Lyon: IARC Press, 2013:p.50-1. Kransdorf MJ, Meis JM. From the archives of the AFIP. Extraskeletal osseous and cartilaginous tumors of the extremities. Radiographics 1993;13:853-84. De Smet AA, Norris MA, Fisher DR. Magnetic resonance imaging of myositis ossificans: analysis of seven cases. Skeletal Radiol 1992;21:503-7. Anand M, Deshmukh SD, Devasthali DA. Fibro-osseous pseudotumour of the metacarpal. J Hand Surg Eur 2011; 36: 701-2. Bekers EM, Eijkelenboom A, Grünberg K, Roverts RC, de Rooy JWJ, van der Geest ICM, et al. Myositis ossificans - Another condition with USP6 rearrangement, providing evidence of a relationship with nodular fasciitis and aneurysmal bone cyst. Ann Diagn Pathol 2018;34:56-59.